Top-down perspective in GTA 1. Top-down perspective was a prominent camera view used in the Grand Theft Auto series, where the player and their surroundings are viewed from overhead, rather than being able to look in any direction. It was the standard viewpoint adopted in early GTA games, including Grand Theft Auto 1 (as well as its Grand Theft Auto: London 1969 and Grand Theft Auto: London 1961 expansion packs), Grand Theft Auto 2 and Grand Theft Auto Advance. It is one optional camera view in Grand Theft Auto III, the first game to utilize an over-the-shoulder perspective, and a variation of the view is used in Grand Theft Auto: Chinatown Wars called isometric perspective. The view can be obtained briefly in Grand Theft Auto IV by rotating the camera above the vehicle and holding it there. The Video Editor for GTA IV can also obtain this view, as can several third-party camera modifications for the GTA III era games. Adopted in both GTA 1 and GTA 2 as the only camera angle in game, the view simply depicts the player and their surrounding from a bird's eye view, directly over the player at a considerable height. The camera system adjusts its height from the player according to the movement and position of the player, relative to the speed in which the player travels. When on foot, the camera draws closer to the player, reducing the player's line of sight as the player moves slower. When inside a vehicle, however, the camera moves further up, and some more when the vehicle's speed increases. Top-down perspective has the disadvantage of a limited line in sight, rendering speedy travel somewhat difficult as the player has little room to foresee the traffic ahead; this, coupled with the lack of camera orientation, made navigation and aiming difficult. 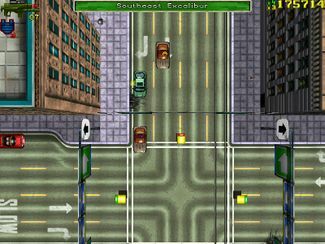 The use of top-down perspective by early GTA games was complemented by the use of a 3D engine that permits the ability to render a portion of a large city as seen overhead, albeit with limited flexibility on city design. The height of buildings and structures are restricted to a certain height, while long underground roadways could not be effectively included unless they are used by trains or partially exposed, as the player would not be able to see underground traffic. The inclusion of gradients in the terrain, however, are possible in top-down perspective, allowing the player to perform jumps off high areas or ramps. Height in a top-down perspective was also used in GTA 2 to comical effect to exaggerate the effects of explosions on people; certain individuals would be flung high enough by a blast that they pass the camera, before plummeting to their deaths. Top-down perspective in Grand Theft Auto IV's Video Editor. This page was last modified on 19 April 2012, at 19:57.